The hottest tickets in London town for the past few months have been for plays written by a man who has been dead for over four hundred years. Of course it helps that most of these sold out, selling-on-eBay-for-£2000-a-pop shows feature handsome famous men taking on some of Shakespeare’s meatiest roles (although even David Tennant in his now ended run at the Barbican may have struggled to make soppy sap Richard II meaty). But whether it’s prose or pecs drawing the crowds and winning the critics, there’s no denying the pull of Will. My weekend was bookended by two very different Shakespeare productions. 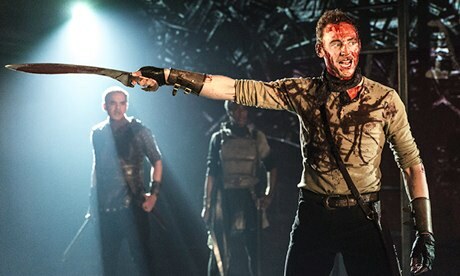 The first was the much talked about Coriolanus at the Donmar Warehouse starring the much talked about Tom Hiddleston. Since beginning its run in December it’s has had some quarters in such a tizz that people have been prepared to spend a huge amounts of farthings for a ticket for this sold out run. There’s not a lot I can add to the chorus of Coriolanus praise; it’s every bit as powerful, thrilling and exciting as the critics have said. It’s a physical, visceral, brutal production that also has moments of reflection and humour. It’s stark simplicity and the almost post-apocalyptic feel of the set and costumes reminded me of the Trafalgar Studios production of Macbeth last year, although Hiddleston’s Coriolanus is a far greater force than James McAvoy‘s rather lacklustre Scottish murderer. Hiddleston could stand on stage in the humble smock he’s forced to wear after Caius’ one-man victory in Coriolis and still emit a room-captivating magnetism. But he doesn’t rest on his charismatic laurels, giving us a soldier who is far more than a sword brandishing brute. That said, he does angry very well; he’s so intimidating as a thoroughly pissed off newly-elected senator unable to engage in – or even injure the idea of – winning the hearts and minds of the dirty masses that he had me agreeing with him about this “us and them” business. Although he does a damn good job of trying to steal it, this isn’t entirely Hiddleston’s show. Deborah Findlay is wonderfully, almost sinisterly, controlling as Caius’ overbearing, power lusty mother Volumnia who discovers the hard way that second hand heroism is great until your son gets kicked out of Rome. Shakespeare’s comedy characters are sometimes the least funny people in his plays, happily in Mark Gatiss’ Menenius Agrippa this is not the case. He manages to be languid and amusing, but also subtle and sensitive, avoiding caricature pitfalls. Hadley Fraser does a good job as Coriolanus’ nemesis Aufidius, playing up the lustiness of Shakespeare’s verse like a desperate man who knows he’s out of his depth (and league). As Caius’ wife Virgilia, Borgen‘s Birgitte Hjort Sorensen has little to do but look sad, sew and stroke Coriolanus’ face when his mum isn’t looking, but not all of Shakespeare’s women are quite so one note. Over on the other side of the river at the new Sam Wanamaker Playhouse, Eileen Atkins delivered a much more sedate, but no less moving evening bringing some of Shakespeare’s more vibrant female characters to life with a one woman performance as legendary actress Ellen Terry. The new Sam Wanamaker Playhouse is every bit as captivating and arresting as Atkins’ performance and the candle lit theatre was the perfect setting for this wonderful, if too brief, production that highlighted the awesomeness of some of Shakespeare’s female characters that are so often dismissed (including by myself) as insipid and weak. The quiet courage, quick wit and intelligence of, amongst others, Juliet, Desdemona and Beatrice was brought to mesmorising life by Atkins, delivering an amalgamation of two of Terry’s lectures on Shakespeare’s women while weaving into them some of their greatest speeches as well as dropping tantalising details of Terry’s glamorous life as a Victorian stage actress. Shakespeare’s famous speeches were so comfortable in Atkins’ mouth and she was such an engaging presence that it was a real wrench when she backed slowly off the small stage to Ophelia’s final speech “Good night, ladies; good night, sweet ladies; good night, good night”. But it’s always good to keep your audience wanting more; Shakespeare knew the secret so well that we’re still wanting more and more of him, lapping up his words four centuries since they were first written. This entry was tagged Coriolanus, Donmar Warehouse, Eileen Atkins, Hadley Fraser, London, London theatre, Mark Gatiss, Much Ado About Nothing, othello, Romeo and Juliet, Sam Wanamaker Playhouse, Shakespeare, Shakespeare's Globe, Theatre, theatre review, Tom Hiddleston. Bookmark the permalink.